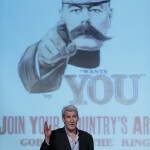 In a one hour presentation Paxman debunks some widely held views of the first World War or Great War largely fought in a European theatre – that it was a war of lions led by donkeys; many men were shot for being conscientious objectors; and that it was going to be over ‘by Christmas’. It lasted of course much longer, was more complex than many understood (then and now), and its story has been further complicated by those seeking to demonise or lionize the key perpetrators depending on personal beliefs or political positions. 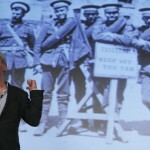 As an Englishman, Paxman writes from his country’s perspective of war and brings personal insights into his discourse, pictures of Uncle Charlie in his mother’s house – a man who, like many, was called up and served on the front, in his case as a stretcher bearer. 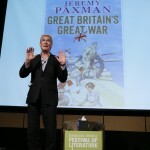 Paxman’s manner is that of a storyteller teacher, weaving a narrative of a critical time in world history which still resonates today. Was it a pointless war asks one questioner… perhaps but global dynamics changed as a result of it, the rise of Nazism being one. Why does he think the war poets, Frost and Sassoon in particular, were part of the problem asks another – because by being taught in English Literature classes they are not assessed from a historical perspective, and as such have perpetuated myths about this being a dreadful war. No war can ever be glorious but to see the Great War solely from one perspective means that the good things that did happen get forgotten. Paxman’s analysis of the front has interesting insights – the challenges of coordinating different attacks with limited technology (messenger dogs and pigeons provided the tweets of the day); the inability to see the ‘big picture’ due to these limited communications meant that the generals had to station themselves away from the front leading to the impression of them being inept and callous to what was happening on the frontline ; the appalling conditions of living in the trenches and how troop rotation avoided any major rebellions; and the almost impossible conditions to treat the wounded which often led to amputations and chronic disabilities. Driven by personal curiosity, Paxman provided a fascinating insight into a world event that continues to shape our current state of affairs.